One of my favorite things to do when family and guests visit us here in Playa Samara, Costa Rica is to head down the beach about 10 kliks to visit the big birds. 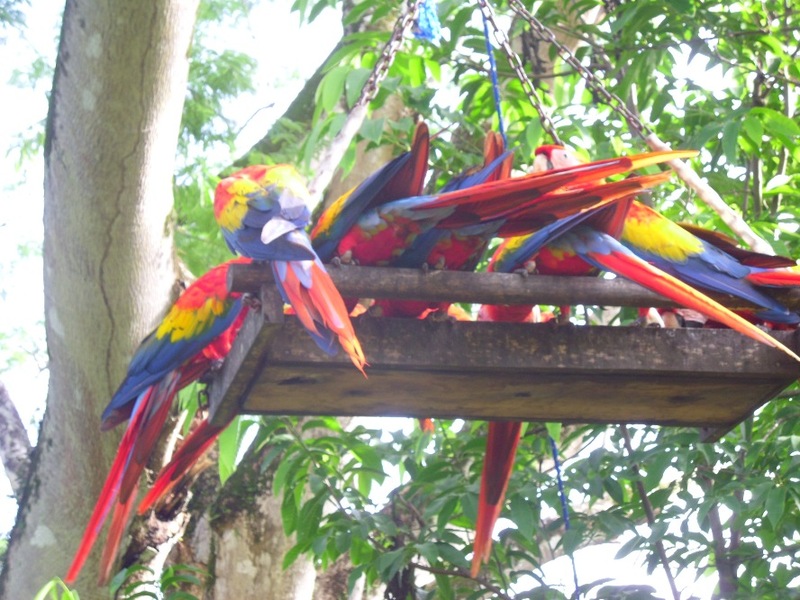 The Ara Project is a breeding center for Great Green Macaws and Scarlet Macaws, both of which used to live all over Costa Rica. The range of the Scarlet Macaws used to cover the country while the Great Greens limited themselves to the Caribbean slope of the continental divide. The populations have been decimated by the usual suspects – development and capture for pets – such that they are both endangered and limited to very small pockets of the country. There are now less than 1000 Great Green Macaws in the world. The Ara breeding birds are mostly rescued and rehabilitated pets that have been abandoned or injured. The center provides a meeting aviary –it’s the equivalent of a singles bar where the birds “hook up” – and individual mating cages – like honeymoon suites, with privacy and solitude. The hatchling birds are then reared for 4 years before they are released to roam the hillsides of Costa Rica. 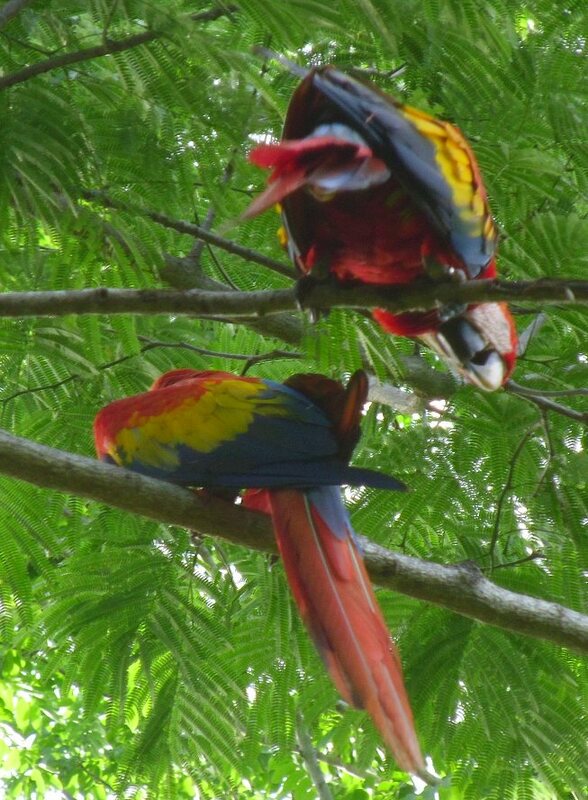 Because they have not learned from their parents, who were probably pets themselves, how to forage in the natural forest and what foods to eat, the newly released Macaws continue to be fed twice a day for as long as it takes for them to learn to feed themselves. 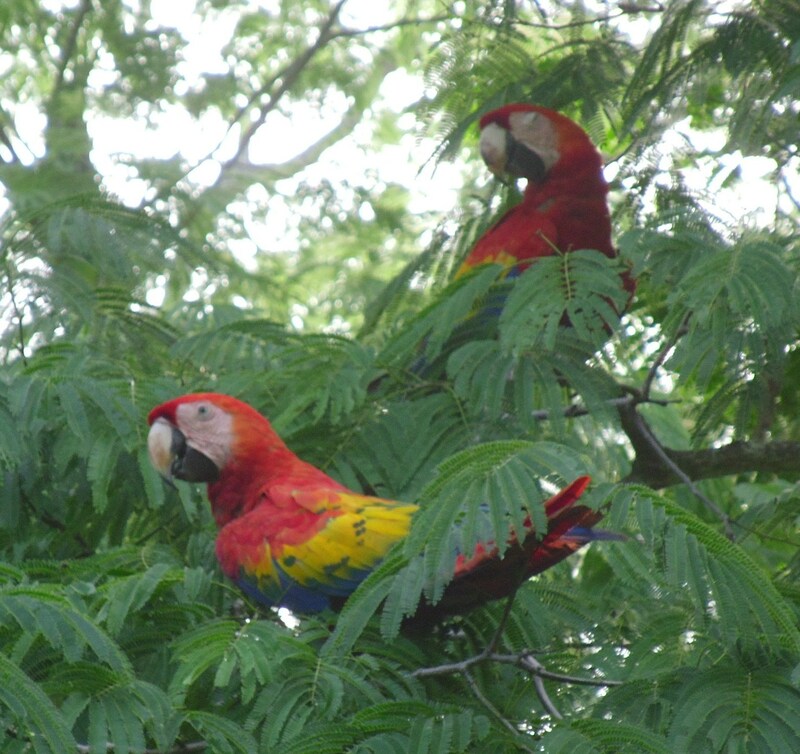 The diet provided to the Scarlet Macaws is gradually altered from sunflower seeds to Beach Almond, Melina fruit and Nance, all found growing naturally in the Guanacaste forest. Although both kinds of birds are bred at the Ara Project near Punta Islita, the Great Green Macaws are released only on the Caribbean side where the Mountain Almond and other east slope fruits make up the preferred diet. 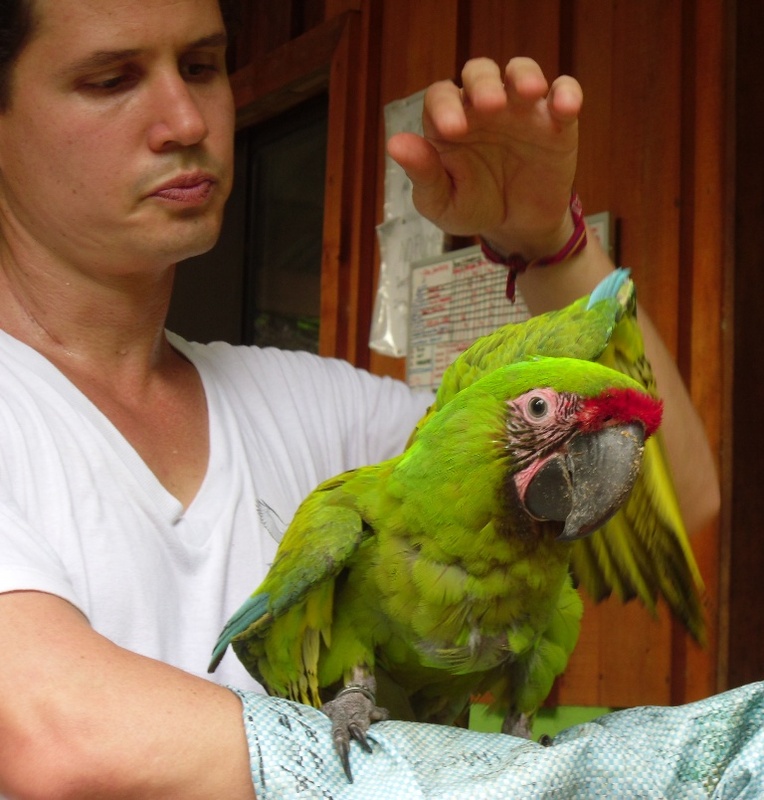 During the tour, the director, Carlos, will tell you about the evils of keeping parrots as pets. Like JJ here, these birds are very social. They become very attached to their hosts and suffer greatly when separated. Their cheeks turn red when they get jealous, like Precious did when I put my arm around Carlos. 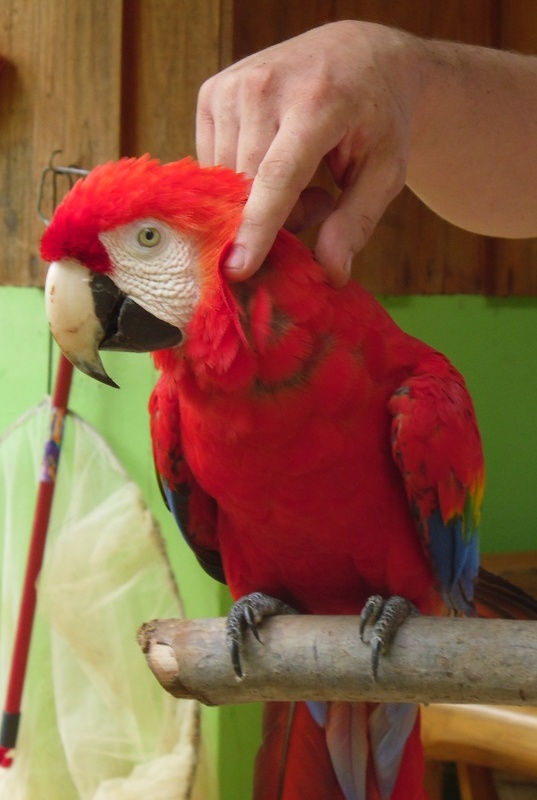 You can visit the Ara Project at 3pm any afternoon to tour the breeding center and watch the afternoon feeding of the free-flying majestic Scarlet Macaws. The center is just west of the Hotel Punta Islita and about 10 kilometers from Casa Mango and Casa Papaya. Call a day in advance to request a tour 6052-9331. This is one of your best yet! Very informative & great photos & video!